In 1937 Pablo Picasso painted Guernica, a mural that was the centerpiece for the Spanish Pavilion of the World's Fair in Paris. The official theme of the Paris Exposition was the celebration of modern technology. The Aeronautics Pavilion, featuring the latest advances in aircraft design and engineering, was a centerpiece of the exposition. 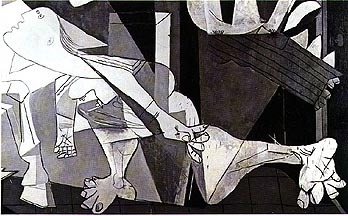 It is a bitter irony that Guernica, the most lasting monument of the exposition, is the Twentieth century's most enduring symbol of the horrors of war and the inhumane use of technology. It is a portent for the terrors of the next decade. 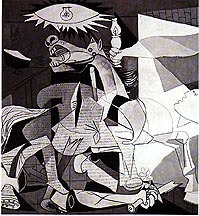 The painting is based on the events of April 27, 1937, when the German airforce, in support of the Fascist forces led by Generalissimo Francisco Franco, carried out a bombing raid on the Basque village of Guernica in northern Spain. At that time such a massive bombing campaign was unprecedented. The hamlet was pounded with high-explosive and incendiary bombs for over three hours. The non-combattant townspeople including women and children were indiscriminately cut-down as they fled their crumbling buildings. The town of Guernica burned for three days leaving sixteen hundred civilians killed or wounded in its smoldering remains. The Fascist planners of the bombing campaign knew that Guernica had no strategic value as a military target, but it was a cultural and religious center for Basque identity. The devastation was intended to terrorize the population and break the spirit of the Basque resistance. In effect it was intended to "shock and awe" the Basques into submission. 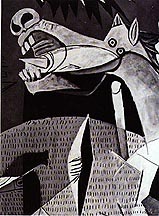 The bombing of Guernica was a sensation in the world press. The Times of London called it the arch-symbol of Fascist barbarity. 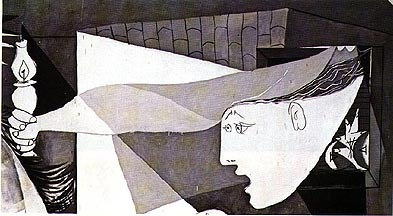 Picasso's painting is without question the most important anti-war work of art produced in the Twentieth Century. It is a testament to the horrors of Fascism. The authority of this image is reflected in the hanging of a tapestry reproduction of Picasso's painting outside the Security Council of the United Nations, an institution which emerged after the defeat of Fascism. It is poignant that this symbol served as the backdrop to many of the public statements by diplomats engaged in the Security Council debate during the winter of 2003 over the use of military force in Iraq. On January 27, a blue curtain was used to cover the tapestry, because someone (it is not clear whether it was a diplomat or member of the media) confidentially approached U.N. officials expressing concern that it would not be an appropriate background if the ambassador of the United States at the U.N. John Negroponte, or Secretary of State Colin Powell, talk about war surrounded with women, children and animals shouting with horror and showing the suffering of the bombings. 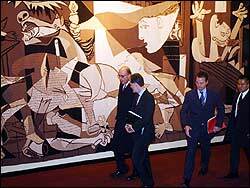 I think Guernica deserves our serious attention. It testifies to the power of representations of war, and should serve as a cautionary tale to us. Although "smart" bombs can be targeted with extreme accuracy, their impact on representations of war in international public opinion can not be controlled. While preparing this webpage on March 26, 2003, reports came in concerning a bombing of a market in downtown Baghad. Both Iraqi and "coalition" spokesmen deny responsibility for the bombing, and there is a major public relations campaign on both sides accusing the other side of responsibility. PBS has produced a valuable website focusing on Guernica as part of a series entitled Treasures of the World. Review this site. Make sure to read the linked pages. At the end of this page I have included a couple of other links. Explore these. The webpage constructed by David Hart as part of his Responses to War includes excellent details isolated from the painting as a whole. Examine the implications of these details. 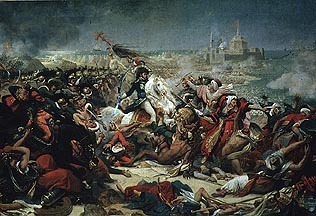 History painters like Gros produced grand public displays of the accomplishments of the French forces of Napoleon in his various campaigns. 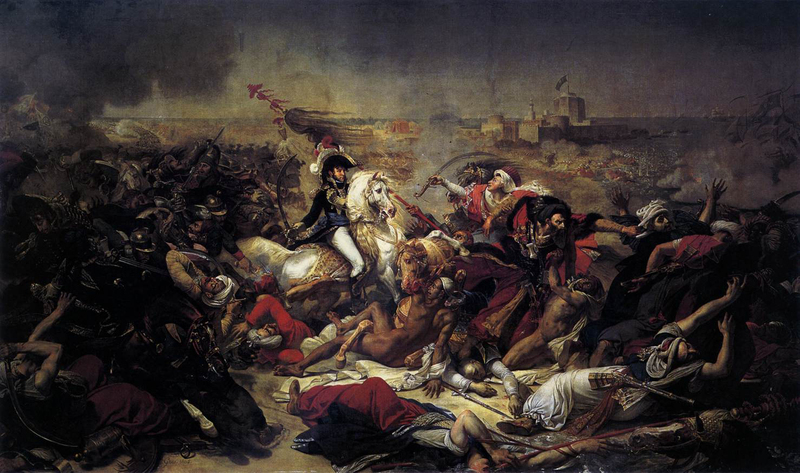 Gros' painting of Murat at the Battle of Aboukir illustrates the heroic calvary charge of the French General Joachim Murat to retake the fortress at Aboukir as part of the Egyptian campaign against the Turks. Paintings like this have an added power today considering our current campaign in Iraq. Again they raise the critical question of representation. Guernica PBS site: Treasures of the World. See the series of prints entitled The Dream and Lie of Franco. 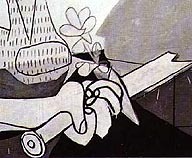 Page dedicated to Guernica from website devoted to Responses to War created by David Hart of the University of Adelaide. Included on this site are excellent pages dedicated to works like Goya's Disasters of War.